ASV unveiled the Posi-Track RT-120 Forestry compact track loader. The RT-120F is designed with a high cooling capacity to let the machine use the largest attachments at maximum levels of power and torque for long periods of time without bogging down or overheating, the company said. The unit includes metal guarding against brush and debris around key areas, such as lights, the air conditioner condenser and the rear screen. A full rear brush guard is also available as a factory-installed option. The RT-120F features a heavy-gauge, falling object protective structure level 2 certified cab, improved rollover protection and reinforced windows for impact resistance. It works with all standard attachments, including mulching heads, brush cutters, backhoes, tooth bars, buckets, snow blades and pallet forks. Featuring the Posi-Track rubber-track suspension, the RT-120F includes both suspended wheels and axles, allowing it to travel quickly over all types of terrain. 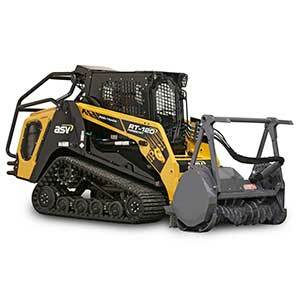 The unit comes standard with 20-inch-wide tracks, resulting in a ground pressure of 4.3 psi, and 15 inches of ground clearance. ASV took its previous closed design and transformed it to an open-rail and drive-sprocket design. The conversion results in easier undercarriage cleaning and improved sprocket and bogie life, ASV said. The tracks are manufactured with embedded co-polymer cords for extra strength and are produced using a single-cure process, eliminating cure-point weaknesses in the track that can lead to premature breakage. These features allow for a 1,500- to 2,000-hour track life, backed by a two-year, 1,500-hour track warranty. The forestry machine’s 120-hp Cummins 3.8-liter, turbocharged engine produces 360 foot-pounds of torque, which is about 8 percent more than the machine’s 111-hp predecessor, the RT-110. The RT-120F meets Tier 4 Final standards using a diesel oxidation catalyst that requires no additional maintenance or replacement filters. The RT-120F’s auxiliary hydraulic system includes 45 gpm high flow and 4,060 psi. It also achieves 16 percent more actual hydraulic hp than the PT-110 compact track loader it replaces. The RT-120F features a rated operating capacity of 3,745 pounds and a tipping load of 10,700 pounds. It is 73 inches wide and has a 125-inch lift height. The unit’s cab is pressurized for a clean operator environment. An optional all-weather cab that includes heat and air conditioning is also available. The RT-120F is also available in dirt and road profiling configurations.